VFD Electrical Noise Issues: Specialized Electronic Services also provides onsite training to help your staff troubleshoot their own vfd drive problems and electronic noise issues. If you have Foreign metal Detectors, Stealth Metal Detectors that have any Electrical Noise Issues, you can count on us. Many of the issues that arise having electrical noise issues come from Foreign Metal Detectors, Stealth Metal Detectors. Electro Magnetic Field or EMF is created around power wires. Radio Frequencies such as walky-talkies, forklifts which induce noise on the low signal supply lines that Foreign Metal Detectors use. And when an AC Power voltage is riding on DC power supplies you no longer have a clean DC power source. CALL US TODAY TOLL FREE NOW: 1-800-681-7374 and we will come to your location to troubleshoot your Electrical Noise Issues. 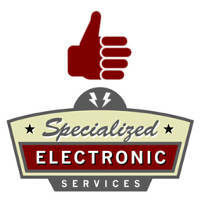 Specialized Electronic Services are experts in fixing Electrical Noise Issues.